Heat a large Dutch oven with one tablespoon extra virgin olive oil. Add the bacon bits and sauté on medium heat till the bits are golden brown. Take the bacon out and keep aside. Add the chicken pieces in two batches and brown on both side, sprinkling salt and pepper. Take the chicken pieces out and keep aside. Reheat the pan and add one tablespoon extra virgin olive oil. Add the mushrooms and sauté on high heat till they are golden brown- about 7 to 8 minutes. Take the mushrooms out and keep aside. Add the onions and garlic. Saute on medium high heat till the onions are soft and translucent- about 3-4 minutes. Add the fresh thyme and tomato paste. Saute for a minute and add the cognac. Scrape all the bits off the bottom and mix for 30 seconds and add the red wine and the chicken broth. Bring to a boil on high heat and add the chicken pieces. Bring back to a boil, lower the heat to a simmer and cover with lid. Take out the two breast pieces after about 20 minutes and keep aside. Continue to cook the rest for another 30 minutes. Take out the chicken pieces with the breast pieces. Bring the sauce to a boil and reduce to about 2½ cups. In the meantime add the flour and oil to a small bowl. Mix well and add to the simmering sauce, whisking it in to avoid lumps. Bring to a boil. Taste for seasonings and add salt if needed. Add the mushrooms and chicken pieces. Top with the bacon bits and chopped parsley. Serve on top of toasted baguette slices rubbed with fresh garlic. 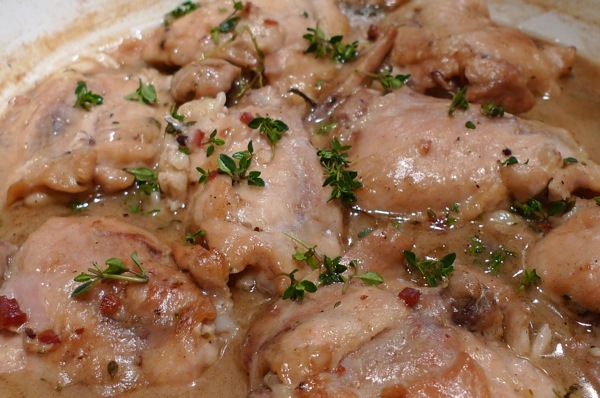 Serve with the same red wine you used for the sauce. Heat a large frying pan with the butter and oil. Add the mushrooms and sauté on high heat for 8 to 10 minutes till they show color. Add the shallots, garlic and salt. Saute for another 3 to 4 minutes on medium heat. Add the mascarpone cheese and sauté for another 2 to 3 minutes. Check for seasonings and garnish with parsley. Anchovies and garlic are a match made in heaven- I absolutely love the two flavors together… I had an amazing steak in South of France that was topped with this mixture.. not exactly the same but the flavors and similar..
Heat a small pan and add the anchovies. Add the butter, oil and garlic. Cook on a low heat for about 5 minutes till the anchovies have melted. Add salt and turn heat off. Let cool for an hour and add the parsley. Mix well. Marinate steak with oil, salt and pepper for 3 to 4 hours. Heat a cast iron skillet and cook the steaks to desired doneness. Rest the steaks for ten minutes before serving. 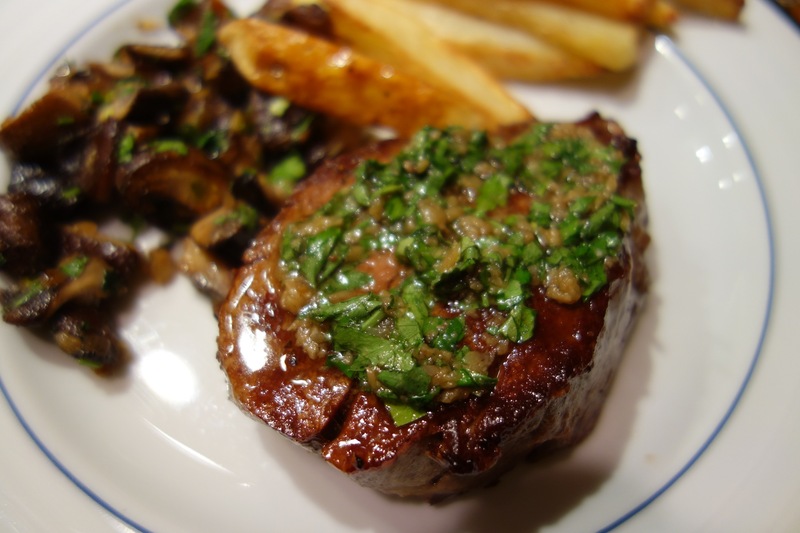 Top with parsley and anchovy mixture and serve. Delicious, delicious- one of my favorite stew recipes. Orange and cinnamon are synonymous with cold weather. I had some stew meat in the freezer. I took it out the night before and made the stew in no time. All you need is some chicken broth and red wine. I always have mushrooms in the fridge- my daughter loves them and they are super versatile. I decided to add them to the mix. I zested and juiced an orange and added a cinnamon stick. It is amazing what those flavors put together do to any dish- whether it is a sweet or savory dish. The stew took no time to put together. It cooked on the stove for a good half an hour, forty minutes. You can cook it even longer, depending on the meat. Everyone loved it- the only problem was that it finished in one sitting. Everyone wanted it the next day. Since I am always looking for ways to incorporate more fish into our diets, my brain is usually working overtime to come up with different recipes that are delicious and healthy at the same time. I wanted to do a simple fish stew that is a bit French and Italian at the same time. I sauteed the fish lightly and added the onions and garlic. For extra flavor, I used parsley and my favorite herb that goes so well with fish- dill. Tomato paste makes this fast stew taste like it has been on the stove for hours. The most important ingredient in this dish (besides the fish) is the fish stock. I was able to find it at Whole Foods and I believe it is available in most grocery store. If you can’t find it, don’t worry- use chicken stock instead but I have to say, the fish stock provides a great flavor to this simple dish. I added potatoes to make this stew a bit more substantial. I was initially thinking of serving a salad with the dish but then decided to come up with a zucchini pesto and served it on top of some toasted bread- that is the Italian part of the meal. My daughter loved the stew including the zucchini pesto bruschetta. My husband and I opened a Pinto Noir and enjoyed a lovely dinner. I was watching food television the other day and saw someone make chicken with 40 cloves of garlic. It looked delicious but it seemed quite labor intensive. I have been meaning to make this dish for a while but have been lazy – so I made it simpler. I decided to use less garlic- it takes too long to peel 40 cloves. I used one head of garlic instead and it was more than enough. I also coated the chicken pieces with seasoned flour before I browned them. I saved a step by doing this- I don’t have to take the chicken out and make a roux separately. I also decided to add pancetta for an extra layer of flavor – boy, what intense flavor bacon gives to a dish! Everything is good with bacon! The fresh thyme is a great addition- it brings a very earthy flavor to the dish. I served the chicken with couscous that I made with pine nuts and currants. I usually add golden raisins to my savory dishes- never used currants before- well I am a fan! They are great tiny little balls of sweetness and go really well in the couscous. My daughter who usually takes the raisins out, somehow didn’t mind the currants in the couscous. I added a little extra chicken broth to the dish so we can enjoy extra sauce with the couscous. So, since the dish didn’t have any vegetables, I was planning on serving a salad. I had baby arugula in the fridge and decided to make it simple and add some lemon juice and salt. It suddenly occurred to me maybe I should serve the seasoned arugula on top of the dish! What a brilliant idea- actually it’s not mine- I have seen it many times on food television– they usually add seasoned greens on pizza, pasta, etc. Well it is a great idea- it tasted fantastic! The lemony arugula was perfect with the creamy chicken and the sweet couscous. It really was a brilliant dish and I think great for company. We drank a Riesling with the chicken- the same one I used to make the sauce. It stood up to the strong flavors of the chicken dish but was light at the same time. It was a very enjoyable meal indeed- nothing better in life than to enjoy great food and wine with the people you love most! I was watching food television the other day- yes, I tend to do that a lot- and someone was making a French bread pizza… It brought back memories. My brother and I used to make it many years ago- I think when we first came to the States from India. We used store bought pizza sauce and a bag of pepperoni and cheese and it was fabulous!! I can still picture the tiny little kitchen in our tiny little apartment! I haven’t made a French bread pizza since then! 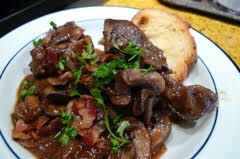 Time to make one, I thought- so I started to picture in my mind… I wanted to use mushrooms – partly because my daughter loves them- and fontina cheese for its mild creamy flavor. I decided to also add caramelized onions for the adults only. The sauce was troubling me- I didn’t want to use the regular run-of-the-mill marinara sauce- not that there is any thing wrong with it- I wanted something different… after a lot of pondering; I came up with a roasted tomato and garlic sauce. Roasting any vegetable makes it sweet and nutty- including garlic. The mild flavor of this sauce went really well with the mushrooms, caramelized onions and the fontina cheese- overall it was a winner. The sky is the limit with the combinations you can add to this kind of pizza or for that matter, any pizza! I love the regular flat bread pizza I make at home or eat at our favorite pizzeria, but when I was eating the French bread pizza- it revoked memories of the amazing crusty bread in Paris! 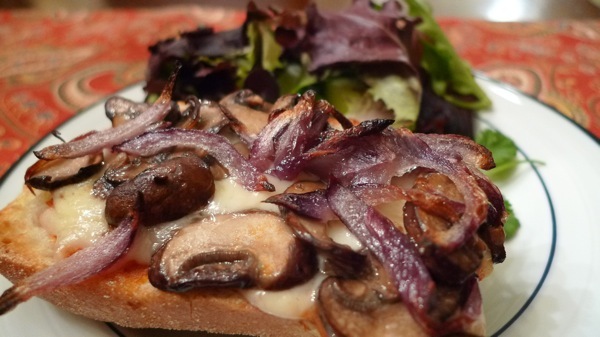 Just for that reason, French bread pizza is my favorite thing to eat- well, at least for now. We ate it with a fresh green salad and of course a French red wine!!! Preheat the oven on 400 degrees. On a cookie sheet spread the tomatoes and garlic and top them with the oil and the salt and pepper. Roast them for about 30 minutes or till the tomatoes are soft and almost bursting. Squeeze the garlic out of the husks. Add the tomatoes and garlic into a blender and liquefy the mixture till smooth. Adjust seasonings. You will need about half of the sauce for the pizza. In a medium frying pan, heat 1 tablespoon olive oil and add the sliced onion. Cook about 20 minutes on medium low heat until the onions are soft and golden brown. Keep aside. 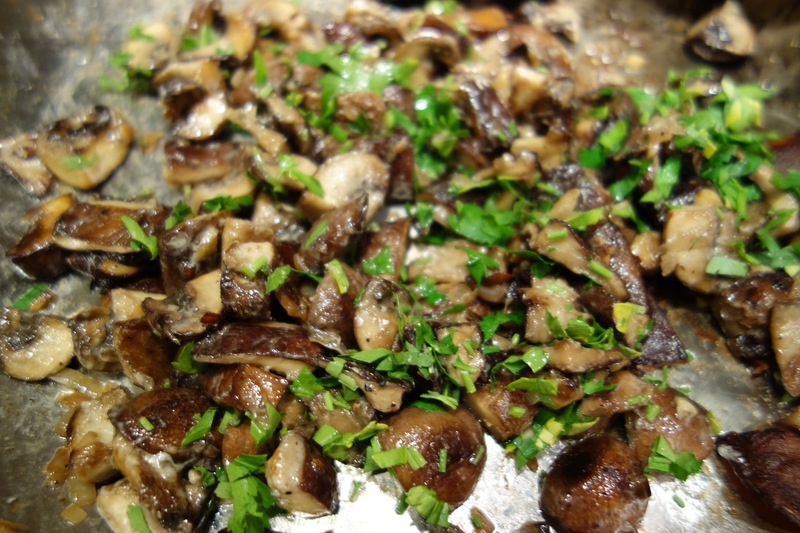 In the same pan, heat the remaining olive oil and add the sliced mushrooms. Cook on medium high heat for about 15 minutes, until all the moisture is evaporated and the mushrooms are golden brown. Sprinkle salt to taste. Keep aside. Cut the baguette in half, lengthwise. Drizzle the olive oil and spread on both sides. Spread the roasted tomato and garlic sauce. Next, add the shredded cheese followed by the mushrooms and onions. Sprinkle salt to taste. Bake for about 10 minutes and serve!